Last year’s ‘High Evolutionary’ was the runaway winner for my album of the year – it’s cinematic scope, the textures and atmosphere it created and sheer bloody genius resonated with me on an almost instinctive level. 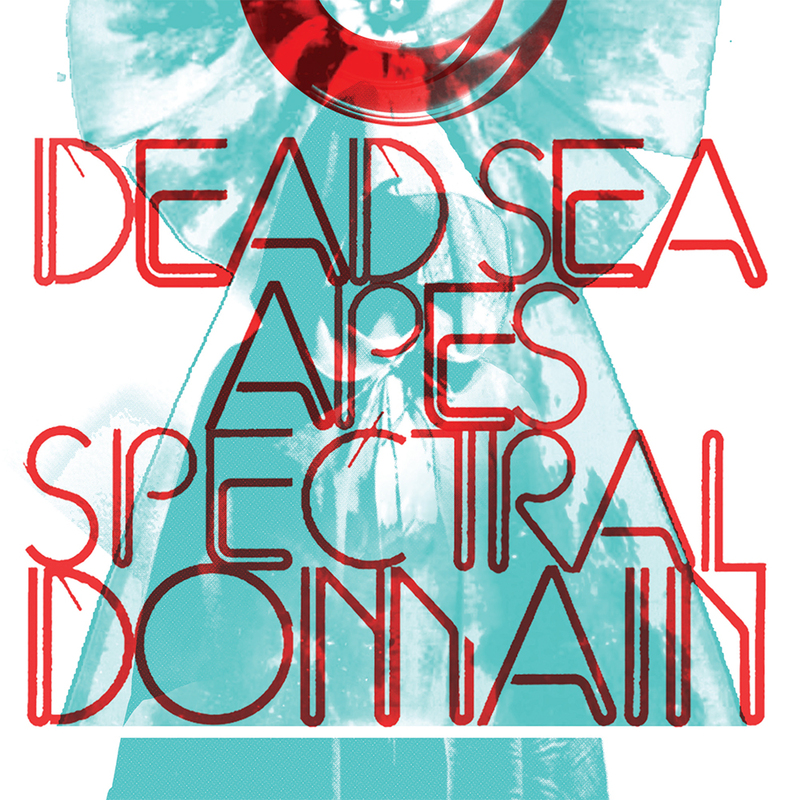 So when the promo of the new Dead Sea Apes album ‘Spectral Domain’ landed I was at once elated and nervous. Elated, well, who isn’t when a fave band drops a new release, and nervous because there’s always that nagging doubt – will it live up to my expectations? I’m pleased to report that this surpassed my expectations, and I’m willing to stick my neck out and say that this is the band’s best so far! It has a more mature, more world weary feel to it, but that is to it’s credit; it adds another layer of texture and dimension. The trio of Brett Savage (guitar), Nick Harris (bass) and Chris Hardman (drums) have conjured up an album full of foreboding and tension that leaves one in an introspective mood, questioning life itself. That is not to say that ‘Spectral Domain’ is all doom and gloom, there is an uplifting quality running alongside the more reflective vein, with Savage’s crystal clear guitar ringing like a clarion call in the dark. ‘Universal Interrogator’, with its introductory drones and tribalistic drumming, immediately sets the tone. It conjures up a sun-baked aridness; a parched trek across monument valley. The rhythm never falters throughout, like a shamanistic motorik drum beat, and the guitar adds the shape and texture to this soundscape, knife sharp at times, at others heavy and fuzzy. I mentioned in my review of ‘High Evolutionary’ about my dislike of the word ‘cinematic’ but, as with ‘HE’, the word is not a misnomer in this case; ‘Universal Interrogator’ is Morricone soundtracking a Tarantino western. My only question is – what is the ‘Universal Interrogator’?….doubt? the human psyche? death? ….or do we read into it what we will? ‘True Believers’ ratchets up the tension with simple but effective guitar ringing out over a solid bassline and drums. It is the musical equivalent to tenuous steps through a dark, strange house….the tension and the fear palpable in the atmosphere it creates. The sense of drama never really abates, and the addition of some eerie keyboard later on only exacerbates it. ‘The Unclosing Eye’ begins with a lone drone and more tribal drums before the guitar once again weaves its storytelling magic, but this time lighter and airier, leaving the drums to create the tension. The guitars at times are redolent of a sixties spy drama slowed down by half, and at times tinged with an eastern vibe but with a lightness of touch throughout, instilling the track with optimism. ‘Brought To Light’ is sci-fi western; the guitar with the familiar twang but with added spacey effects scattered throughout like moon dust giving it a cosmic edge. It put me in mind of Anthroprophh’s mighty ‘UFO’ at times – the mix of alien mythos and top-notch musicianship. The album closes with ‘Sixth Side of the Pentagon’ and is a trancey/noir dub workout, Harris’ bass taking centre stage and throwing out a bass line that could have come from the Black Ark Studios. The addition of some krautrock synth washes and some more cracking guitar from Savage gives the track a kosmische feel. It is an innovative, imaginative track that shows the level at which these guys are working and thinking. This is another superlative album from Dead Sea Apes and must surely cement their place at the head table of psych/kraut/left field bands working today. An album in which to get lost and be transported away to distant lands, nay, worlds. The level of musicianship is up there with the best and, in the capable hands of the mighty Cardinal Fuzz, and this time round, those great dudes at Sunrise Ocean Bender, have produced a product that looks as good as it sounds: released in purple/clear swirl vinyl and some magnificent artwork from Luke Insect. Will this copy its predecessor and become my album of the year? I wouldn’t bet against it….and in this year of fantastic releases, that is saying a lot. A(nother) masterpiece from the Dead Sea Apes! !